ETA Travis Hudson from San Antonio, Texas. Photo Credit: Victor Salomine. The good-looking young man in the photo is ETA Travis Hudson from San Antonio, Texas, who sent along his interesting bio and photos to be posted in Focus On. The opening paragraph of Travis's bio, which relates the story of his early Elvis experiences, is a delight to read. Travis included a great photo of when he was 14, dressed as Elvis, to accompany his story. ETA Travis Hudson. Photo Credit: T. Hudson. Travis’s photo from his youth reminds me of ETA Sylvain Leduc’s similar photo he shared of himself dressed in a homemade jumpsuit that he hand-decorated in his teens. Different places, different times, but parallel stories of young teens wanting to express their admiration for Elvis Presley in their own unique ways, and both growing up to be successful ETAs. I am always pleased when ETAs send personal photos to be included in their post as they add such wonderful visual appeal to their story. Travis also sent some great performance photos and some still shots to add to his post. 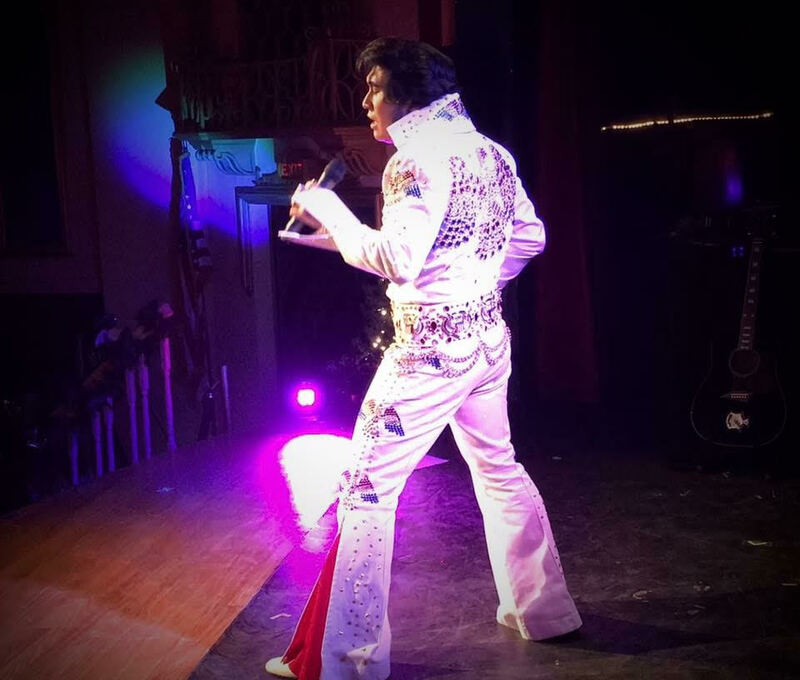 As well as having a closet full of Elvis jumpsuits and costumes, Travis, a dedicated Elvis fan, has an extensive collection of Elvis memorabilia which I was privileged to see in photos. It is such a pleasure introducing ETA Travis Hudson to SIDEBURNS Magazine readers--an ETA who puts so much heart into his tribute. Best regards, Carolyn. ETA Travis Hudson rocking the red jumpsuit. Photo Credit: Mary Luna Pevey. Travis Hudson is originally from Guatemala. He resides in San Antonio, TX. He is always asked if he is from San Antonio, and his response is, “No, but I got here as soon as I could.” Travis’s first language is Spanish, but since he has been in Texas most of his life, he now speaks Tex-Mex. Travis has been married to his beautiful wife, Natalie Hudson, for almost 8 years, and they have a son, Nathan, who will be turning 3. Travis’s wife, who is a cosmetologist in San Antonio, taught Travis to do his hair and makeup. At the age of 14 Travis saw a man on TV and asked his mom who he was. His mom said, “That’s Elvis.” Travis’s response was, “Wow he has some really nice hair. Can you make me a jumpsuit?” His mom looked at him with an “are you nuts” expression, but she agreed to make him a jumpsuit. They both went to Hobby Lobby, and together they made a costume—from the jumpsuit and cape, right down to the shoes. Once the jumpsuit was done, Travis wore it to school for no apparent reason. The teachers and students started coming out of their classes to get their pictures taken. Travis didn’t sing Elvis songs at the time, nor he did he own one song of Elvis. A teacher approached Travis and asked him if he would like to sing for the debate competition that was coming up on the weekend. Travis then had to ask his dad to buy him a karaoke machine and to go to a music store and buy an Elvis karaoke track. Travis thought he would be singing in front of 20 people or so. It turned out to be over 400 people that he sang in front of on a stage. The first two songs that he sang were “Teddy Bear” and “All Shook Up”. Little did Travis know that this would pave his way into the ETA world. Travis, who is now 34 years old, is first and foremost a huge Elvis fan. He started his ETA career a little over three years ago. He has been collecting and receiving items, and has a room in his house dedicated solely to his Elvis collections. Travis sings mainly all over Texas, but has travelled to other states. Travis entered his first Elvis competition in Dallas, TX, in 2017 and made it to the semi-finals. Travis has performed for some big companies, such as Google, Rack Space, DR Horton, and State Farm, to name a few. He has done some local Elvis contests where he placed 1st and 3rd. Travis sings for many private events. 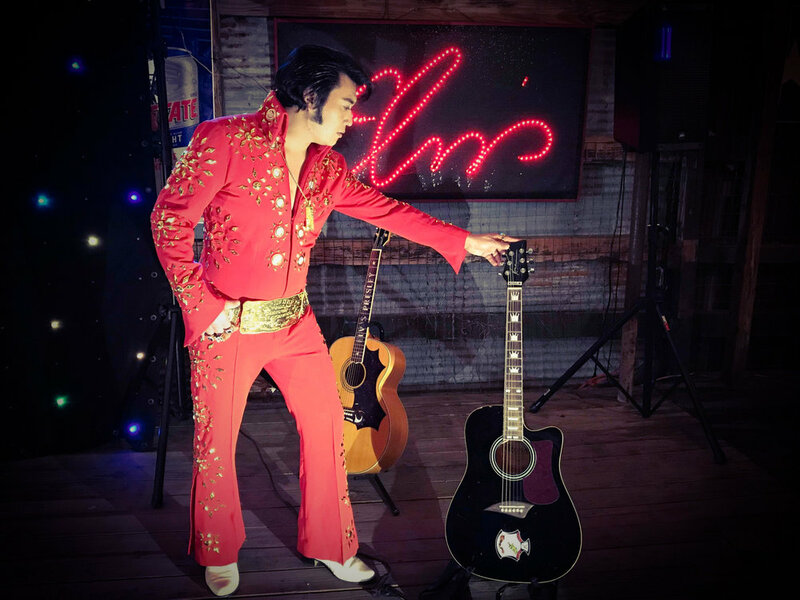 If you want to catch Travis in concert, he performs every year at Chuys Mexican Restaurant in San Antonio for Elvis’s birthday. Travis will also be in Houston, TX, on March 24th, for a public show at the Blue Wolfs Bar and Grill. He also has another big show at the Glade Water Opry in Glade Water, TX, on May 18th. Travis enjoys performing in someone’s backyard, as well as the ‘big stage’. He believes that every ETA has something special to bring to the stage that makes their tribute unique. He feels that although we all come from different backgrounds and ethnicities, in the end we are paying tribute to the one and only Elvis Presley. Travis believes that we all have a little Elvis in us. Photo Credits: Top Row L to R: Jeremy Hutchings, Travis Hudson. Bottom Row L to R: Natalie Hudson, Victor Salomine, Travis Hudson. Nathan Hudson, son of ETA Travis Hudson and his wife, Natalie, shows signs of following in his dad's footsteps in the video below. Thank you, Travis, for sending your bio and photos to be posted on SIDEBURNS Magazine.